Ghee rice is a flavourful rice dish that can be served with any spicy curry to make every occasion special. Prepared with Biriyani rice or Jeerakasala Khaima rice, Ghee rice is a popular dish in the Malabar region of Kerala. 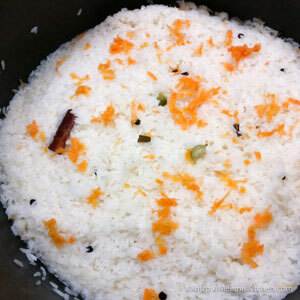 A lot of readers and friends had asked me for ghee rice recipe, and I thought it was too simple a recipe to share. Compared to Pulao or Biriyani, Ghee rice is a simple dish but with flavours that endure; each grain of rice coated in Ghee with mild yet pleasing spice flavours and aroma. 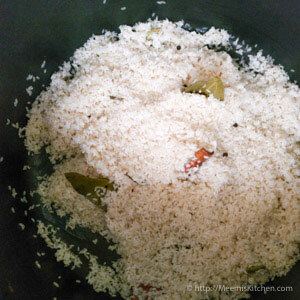 Cooking of rice is important as well, and I have added the tips to make perfect ghee rice, without any lumps. I love all kinds of rice, be it Kerala brown rice with thoran and fish curry or white rice with sambar or Rasam, or fried rice and chilli chicken or Pulao and Paneer, or Mutton, Chicken or Fish Biryani. For me, at least one meal a day should include rice or I will feel empty. Not all my kids share my love for rice, they love Pizza, Noodles or Pasta, Rotis and breads more than rice. They prefer flavoured rice like ghee rice, lemon rice, curd rice, tomato rice, fried rice or Biryani to plain rice. When you have surprise guests, Ghee rice is the best way to spruce up your meals. It can be made in a jiffy and does not require elaborate process. Best part is, it can be paired with Mutton curry, Chicken curry, Masala chicken roast, Paneer dishes, veg. dishes or literally any spicy gravy. In some Ghee rice preparations, Ginger garlic paste is added to increase the flavour, although I like to keep it simple. The pearly white grains of rice topped with fried onions and nuts are delightfully flavourful and does not really need any boosting. 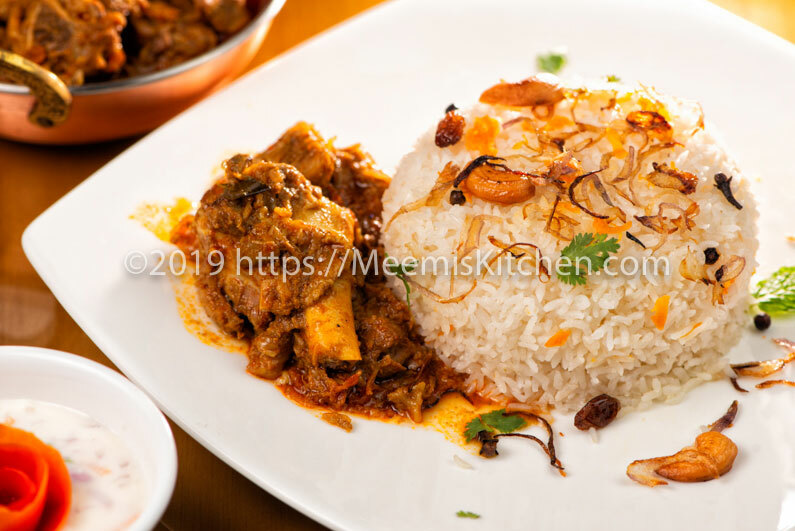 Neychoru/ Nei choru is essentially flavoured aromatic rice gently laced with onions, nuts and spices and is served in most Muslim functions like Eid and is very popular in Kerala. Though the term “ghee” might put off the weight watchers, I think it would be a loss if you say ‘NO’ to this recipe. A mix of coconut oil and ghee is what I have used for this recipe, and it is incredibly hard to resist that extra spoon of rice. Do not count your calories for once, just chill and enjoy! Wash and soak the rice in water for half hour. Drain and keep aside. Heat Coconut oil + Ghee in a Pot (preferably non-stick to avoid breakage of rice) and fry the cashews, Kismis and onions sepeartely, till golden brown, drain and keep aside. Add whole spices – Cardamom, Cinnamon, Cloves, Pepper corns, Bay leaf, to oil followed by rice. Fry the rice for some time. Add double measure of Boiling water, enough salt and lime juice and cover and cook on low flame till the rice is almost cooked and add the grated/ finely chopped carrot. Continue cooking on low flame covered till the water is fully dried. Keep it half open for cooling. Do not mix the rice, or stir with spoon while the rice is hot, as it will lead to breakage of rice and will also result in lumpy rice. Once it is cool enough, gently stir the rice with a wooden fork to separate the grains. Garnish with fried onions, nuts, kismis and chopped coriander leaves. Serve with Mutton Curry, any thick gravy chicken curry or Paneer dish along with Raita and Papad. Jeerakashala rice/ Khaima rice is best suited for Kerala Ghee Rice. Always prepare Rice and allow to cool. It is important to cool the rice to ensure that the rice grains stay intact. Do not stir or mix rice when it is hot. The rice will be soft and will lead to breakage and lumpy rice. Adding carrot is optional. It makes the ghee rice colourful and appealing. You can use Ghee alone instead of Coconut oil and ghee mix. Lime juice keeps the rice from sticking together and gives the pearly white glow to the rice. Ghee rice can be served with any spicy gravy, Raita and Papad. Have a hearty lunch or Dinner with this flavourful and delicious Ghee rice. If you found this recipe helpful, please let me know through comments or share it with your friends. It will keep me motivated. God Bless! !